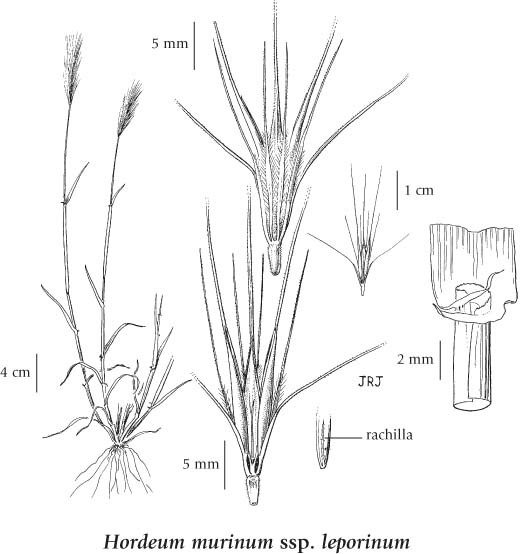 Annual grass from fibrous roots; stems smooth, 20-40 (50) cm tall. 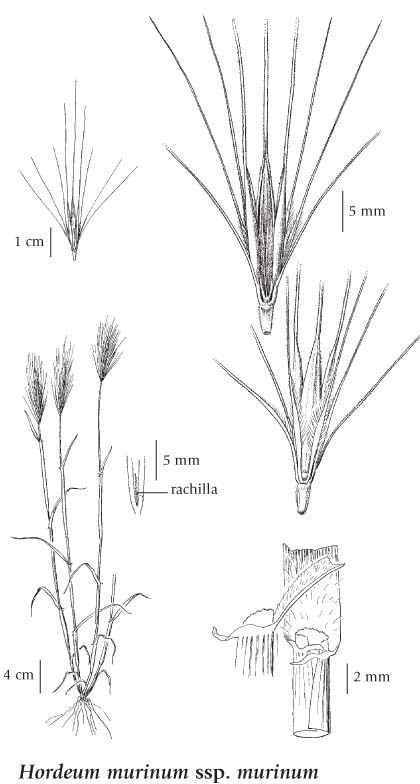 Sheaths open, smooth; blades usually sparsely stiff-hairy to soft-hairy, mostly 3-4 (5) mm wide; ear-shaped lobes well-developed at most leaf-bases, 1-2 mm long; ligules scarcely 1 mm long. Inflorescence a spike, 4-7 cm long, well exserted to partially enclosed by the inflated upper sheath, the rachis disarticulating, the segments 1.7-3 mm long; spikelets 3 to a node, all well-developed, the lateral ones short-stalked; glumes of the central spikelets 2-3 cm long, stalked or unstalked, long stiff-hairy basally, central florets slightly shorter to much shorter than the lateral florets; the rachillas prolonged past the florets for 2.5-3.5 mm, bristlelike; anthers 0.4-1.3 mm long. 1. 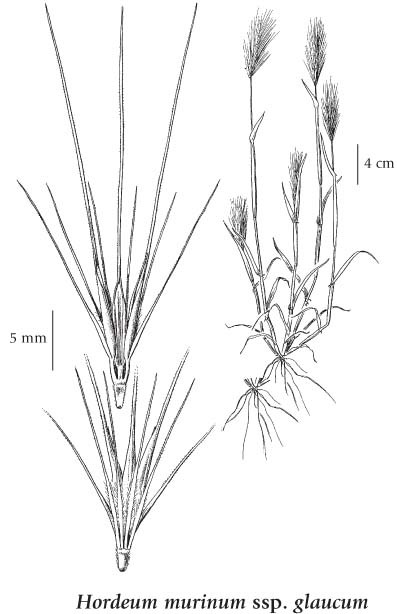 Central spikelet florets stalked, the stalks 1-2 mm long; inner glumes of the lateral spikelets as wide as those of the central spikelets. 2. Central florets much shorter than the lateral florets; anthers 0.8-1.3 mm long.................... ssp. leporinum (Link) Asch. & Grabn. Dry roadsides and waste areas in the lowland, steppe and montane zones; rare to infrequent in SW BC (all ssp.) and SC BC (ssp. murinum); introduced from Europe.